First manned spaceflight, one orbit of the earth. Strap attaching service module failed to separate from capsule, leading to wild ride before it burned through during re-entry. AKA: Kedr (Cedar). Launched: 1961-04-12. Returned: 1961-04-12. Number crew: 1 . Duration: 0.0750 days. Location: RKK Energia Museum, Korolev, Russia..
11 April 1961 was a 'reserve' day in the launch plan, but it was not needed. All the Chief Designers and Military Space chiefs were at the cosmodrome. Gagarin spent that day in meetings with the prominent personalities. Family: Manned spaceflight. People: Gagarin. Country: Russia. Spacecraft: Vostok. Launch Sites: Baikonur. Agency: RVSN. 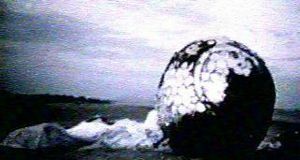 Vostok 1 Capsule after landing. Gagarin with Korolev before flight. 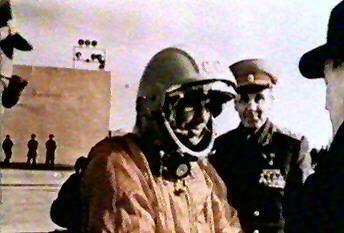 Korolev during Vostok 1 flight. 1961 February 12 - . Launch Vehicle: N1. Space plans - . Nation: Russia. Related Persons: Korolev, Mikhailov. Program: Vostok. Flight: Vostok 1. Spacecraft: Vostok. Kamanin describes Korolev. He is unable to make a decision about the man's true nature. Everyone is excited about the new seven-year plan, approved on 23 January 1960 in decree 711-296, which authorises design work to start on the N1 superbooster. In the immediate future, Vostok 3KA flights are planned every 8 to 10 days beginning 22 February until the first manned flight is achieved. The first flights will use mannequins to test the cosmonaut ejection seat. A manned flight will be attempted after two consecutive successful mannequin flights. In the West, the failed Venera 4 launch is being analysed as an attempted manned flight. Some Italians claim to have picked up voices on radio from the satellite. Kamanin describes all of this as unfounded speculation -- the Soviet Union will not risk a man's life until two fully successful mannequin flights demonstrate safe recovery. Vostok suit review - . Nation: Russia. Related Persons: Alekseyev, Semyon. Program: Vostok. Flight: Vostok 1. Spacecraft Bus: Sokol. Spacecraft: Sokol SK-1. A review is held at Factory 98, where Alekseyev is developing the Vostok spacesuit..
1961 February 20 - . Korolev space plans - . Nation: Russia. Related Persons: Korolev, Vershinin. Program: Vostok. Flight: Vostok 1. Spacecraft: Vostok. Korolev gives a briefing to Vershinin and other military leaders at OKB-1 laying out his proposed plans for space in the next two to three years. He pushes for VVS to purchase 10 to 15 Vostok-1 or Vostok-3A spacecraft for a sustained manned flight series. The next Vostok flight is now delayed to 27-28 February. He reviews the two Vostok-1 flights to date. The first successfully orbited and recovered the dogs Strelka and Belka, the second failed to reach orbit, but the capsule successfully landed 3500 km downrange near Yakut in the Tura region, after reaching an altitude of 214 km. The dogs survived a 20-G re-entry and hard landing in the capsule. 1961 February 24 - . VVS Program Review - . Nation: Russia. Related Persons: Alekseyev, Semyon. Program: Vostok. Flight: Vostok 1. Spacecraft: Sokol SK-1, Vostok. A A Kobzanev heads the review. The decision is made that the first launch of Vostok-3 will not have to be contingent on full ground test of each and every system. The gas analyser and antenna deployment unit of the NAZ still have not completed tests. However for the second mannequin flight, all systems must be operative. Other essential tests needed to clear the spacecraft for manned flight include: several ejection seat tower tests; one ejection seat test from the capsule, a test of the emergency abort system at the launch pad, sea trials of the spacesuit and NAZ. After a thirteen-day endurance trial the humidity within the spacecraft should not exceed 60%. In the tests so far, the humidity reached 80% and the temperature 35 deg C after only nine days. The first launch is now set for 2-3 March and the second for 20-25 March. Therefore the Soviet Union should be able to launch the first man into space by the end of March at best, with the first half of April being more likely. 1961 February 27 - . Suit and ejection seat delays - . Nation: Russia. Related Persons: Alekseyev, Semyon. Program: Vostok. Flight: Vostok 1. Spacecraft: Sokol SK-1, Vostok. Alekseyev's bureau continues to be the pacing organisation for the first manned flight. All trials of the suit and seat must be completed by 20 March. The second Vostok 3KA will not be allowed to fly until these tests are completed - which Alekseyev says won't be done until 21-25 April. Installation of unqualified systems in the capsule is seen as high-risk. In the evening the State Commission reviews the matter. The tests must be completed as follows: Alekseyev's tests of ejection of a mannequin from a capsule must be completed no later than 10 March; the LII test centre must complete two ejections into the wind stream from the Il-28 bomber testbed; sea trials of the NAZ ejection seat much be conducted by 10-20 March; and a ten-day test will be conducted from 2 to 12 March of the environmental control system. 1961 March 4 - . Vostok flight preparations - . Nation: Russia. Related Persons: Alekseyev, Semyon, Korolev, Yazdovskiy. Program: Vostok. Flight: Vostok 1. Korolev, Alekseyev, Yazdovskiy, and other engineers lay out the plan for the preparation of the cosmonaut on launch day. The cosmonaut will be put in Nedelin's cottage at Baikonur Area 2 the night before the launch, be awakened five hours before launch, and undergo a physical examination. Kamanin and Korolev will be in the bunker at the launch pad for at least the next two launches. After the launch, Kamanin is to fly to the recovery zone to be present for the landing of the spacecraft. 1961 March 7 - . LV Family: R-7. Launch Vehicle: Vostok 8K72K. R-7 Failure Commission - . Nation: Russia. Related Persons: Bogomolov, Glushko, Keldysh, Korolev, Kosberg, Sokolov. Program: Vostok. Flight: Vostok 1. Spacecraft: Vostok. Keldysh, Korolev, Sokolov, Glushko, Bogomolov hear testimony from Kosberg on the causes of the RO-7 engine failure on the 22 December 1960 launch, that resulted in the suborbital flight of the Vostok capsule with a landing in Tura. The causes are not completely understood, but the bottom line is that a fuel line must have leaked. Further testimony is offered on the booster trajectory, landing time at various points along the trajectory, tracking station readiness, communications lessons, and recovery efforts. The communications are clearly unreliable. The radius of the HF radio is 5000 km, and 1500 km for UHF. TsP Moscow and PU Tyuratam, plus Novosibirsk, Kolpachev, Khabarovsk, and Yelizov (Kamchatka) all have HF and UHF transceivers. But due to practical reception problems, only UHF communications were available at Tyuratam, Kolpachev, and Yelizov, and only HF at Novosibirsk and Khabarovsk. It is recommended that each IP tracking station should have a Chief Communications Officer, a cosmonaut to act as capsule communicator, a physician, and a representative from the Ministry of Communications to assure action on problems. 1961 March 9 - . 06:29 GMT - . Launch Site: Baikonur. Launch Complex: Baikonur LC1. LV Family: R-7. Launch Vehicle: Vostok 8K72K. Korabl-Sputnik 4 - . Payload: Vostok 3KA s/n 1. Mass: 4,700 kg (10,300 lb). Nation: Russia. Related Persons: Mozzhorin, Yazdovskiy. Agency: RVSN. Program: Vostok. Class: Manned. Type: Manned spacecraft. Flight: Vostok 1. Spacecraft: Vostok. Duration: 0.0700 days. Decay Date: 1961-03-09 . USAF Sat Cat: 91 . COSPAR: 1961-Theta-1. Apogee: 239 km (148 mi). Perigee: 173 km (107 mi). Inclination: 64.90 deg. Period: 88.60 min. Carried dog Chernushka, mannequin Ivan Ivanovich, and other biological specimens. 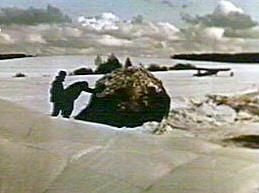 Ivanovich was ejected from the capsule and recovered by parachute, and Chernsuhka was successfully recovered with the capsule on March 9, 1961 8:10 GMT. 1961 March 10 - . Zainsk-Kuibyshev-Moscow - . Nation: Russia. Related Persons: Vershinin. Program: Vostok. Flight: Vostok 1. Spacecraft: Vostok. Kamanin spend the night in a new hotel with much-appreciated electrical heating. At 11 am they fly to Moscow with Chernushka, the small living specimens, and the mannequin. The flight was a complete victory - all is now ready for the first manned flight into space. 1961 March 13 - . Cosmonaut training - . Nation: Russia. Related Persons: Vershinin. Program: Vostok. Flight: Vostok 1. Vershinin formalises two decrees - one to supply a Tu-104 to TsPK for cosmonaut zero-G training, the other for two Il-14's with HF transponders for long-range communications. Two further questions are discussed - should the cosmonauts be given the code for unlocking the manual orientation system of the spacecraft? It is decided they will be. And when will the flight be announced? Kamanin's position is that should happen as soon as the spacecraft safely reaches orbit, the others only want to make the first manned flight public after landing. It is decided to refer the matter for decision at the General Staff level. Vostok State Commission - . Nation: Russia. Related Persons: Alekseyev, Semyon, Keldysh. Program: Vostok. Flight: Vostok 1. Spacecraft: Vostok. The Commission, headed by Keldysh, meets at 11:00. Alekseyev gives the first presentation. The required four ejection seat tests from an Il-28 bomber test aircraft have not even begun yet, or the tower tests of the NAZ ejection seat. They are planned for the next 7 to 10 days. On the other hand ejection tests from the sphere on the launch pad have been completed with satisfactory results. Nikolayev of OKB-124 briefs on the environmental control system. There are still problems with the oxygen regenerator. The fixes made so far resulted in little improvement in performance of the system during the latest ten-day trial. The only solution seems to be to abandon the system entirely and replace it with a different one using active chemical regeneration, but this will take 14 to 15 days. The gas analyser still operates poorly. Despite all problems not having been solved as required, the decision is made to proceed with the unmanned launch anyway. 1961 March 29 - . 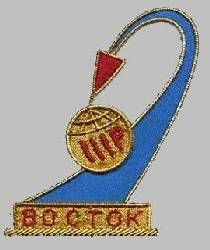 State Commission on Vostok 1 - . Nation: Russia. Related Persons: Ivashutin, Ustinov. Program: Vostok. Flight: Vostok 1. Spacecraft: Vostok. The commission meets from 16:00 to 18:00 to assess readiness for launch. Korolev says he is ready to launch a man, following the two consecutive successful mannequin flights. Who will be selected to be the first man in space? The commission discusses the issue at some length. Afterwards, Kamanin meets with Ustinov at 18:30 and shows him a picture album of photographs taken from Vostok on the March 9 and 25 test flights. One taken over Turkey clearly shows the city of Alexandretta and the concrete runways of the airfields, demonstrating the military potential of the system. All is ready for the flight. The Central Committee of the Communist Party has issued a decree that the first man be launched into space between 10 and 20 April 1961. Three variant press releases are prepared, for 1) attainment of a successful orbit; 2) after a successful landing; and 3) in the event of an emergency landing with a request for international assistance in recovery and return of the cosmonaut. The consensus is that the APO destruct system used in the unmanned test flights will be deleted for the manned flight. Only Ivashutin is against this. Two successful ejection tests from an Il-28 bomber were reported from LII, finally completing a key milestone required for the flight. 1961 March 30 - . VVS Recovery Plans - . Nation: Russia. Program: Vostok. Flight: Vostok 1. Spacecraft: Vostok. An air fleet has been assigned for the first manned flight. Aircraft that will be deployed with UHF direction finders include 20 Il-14, 3 An-12, 2 Tu-95, 10 Mi-4, and 3 Mi-6. Two Il-14 with HF direction finders will be deployed to Kuibyshev and Sverdlovsk. 1961 April 13 - . Vostok 1 State Commission - . Nation: Russia. Related Persons: Brezhnev, Gagarin, Vershinin. Program: Vostok. Flight: Vostok 1. The commission meets from 09:30 to 12:00, making the official interview of Gagarin on his flight. There are unending questions. Afterwards Gagarin fields more questions by phone from the press. In the second half of the day he is readied for the return to Moscow. He has to make a half-hour speech to Khrushchev, but he hurries through the prepared text. Two or three trainers had noted this impatience of his, but Kamanin had already decided before the flight that Gagarin had the makings of a good orator. 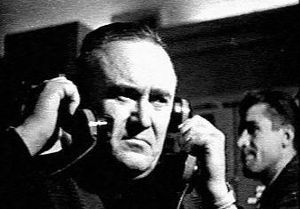 In the evening Brezhnev calls twice, and Vershinin several more times, coordinating things for Gagarin's return to Moscow. Bad weather is predicted for the next day and it is decided that Gagarin's airplane will arrive at Vnukovo. Gagarin is to exit the aircraft and walk alone to the reviewing stand. For this performance he is measured for a new uniform and great coat. He rehearses the speech twice, with Kamanin playing the part of Khrushchev in posing impromptu questions. Gagarin returns to Moscow - . Nation: Russia. Related Persons: Agaltsov, Gagarin, Khrushchev, Yazdovskiy. Program: Vostok. Flight: Vostok 1. 1961 April 15 - . Gagarin in Moscow - . Nation: Russia. Related Persons: Gagarin, Korolev. Program: Vostok. Flight: Vostok 1. Gagarin first meets with Korolev, then holds a press conference. At 15:30 he meets with the VVS Military Soviet..
1961 April 16 - . Sunday in Moscow - . Nation: Russia. Related Persons: Gagarin, Khrushchev. Program: Vostok. Flight: Vostok 1. Gagarin and Kamanin spend the day at Khrushchev's dacha..
1961 April 17 - . Gagarin back at TsPK. - . Nation: Russia. Related Persons: Gagarin. Program: Vostok. Flight: Vostok 1. He returns to the cosmonaut training centre, and later gives a television interview..
1961 April 18 - . Gagarin physical examination. - . Nation: Russia. Related Persons: Gagarin. Program: Vostok. Flight: Vostok 1. He checks into the Central Aviation Hospital for five to six days of intensive physical tests and observation. Denisovo and Borzenko from Pravda interview him during this period for the book that is to be issued. Kamanin has been named as the editor for the work. 1961 April 21 - . Vostok 1 awards - . Nation: Russia. Related Persons: Bondarenko. Program: Vostok. Flight: Vostok 1. Kamanin is having to take a lot of time preparing the paperwork for awards and promotions to be made as a result of Gagarin's flight. Of 500 VVS staff connected with the flight, 200 are to receive recognition of one kind or another. In the evening the VVS Military Soviet convenes to take testimony on the death of cosmonaut Bondarenko. It is found there were serious defects in the organization of the tests conducted at IAKM. 1961 May 1 - . May Day - . Nation: Russia. Related Persons: Gagarin, Khrushchev. Program: Vostok. Flight: Vostok 1. Gagarin stands on the reviewing stand above Lenin's Mausoleum with the Soviet leadership. Kamanin finds the parades and demonstrations colourful but lacking genuine enthusiasm..
1961 May 5 - . Cosmonaut reception - . Nation: Russia. Related Persons: Malinovskiy. Program: Vostok. Flight: Vostok 1. Malinovskiy, head of the VVS Miliatry Soviet, and his wife and daughter throw a reception for the cosmonauts and their wives. The party goes from 18:00 to 24:00 and passes without incident, but Kamanin found the guests' attempts to convince Malinovskiy to support military space projects were unproductive. He just doesn't get it.